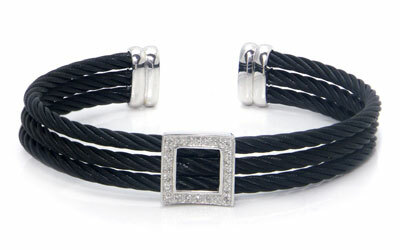 A really cool bracelet to radiate your charming look while you go out during the day and party at night. This bracelet, which somehow resembles to the design of a belt, has a deep black color of stainless steel. That is why the silver bangle and especially the diamonds look very striking. You will too look so eye-catching easily, only by putting this bracelet on. Compliments….compliments….. you will never get enough of them.